Lamia Karim: The fall of Muhammad Yunus and its consequences for the women of Grameen Bank. In 2006 the Grameen Bank of Bangladesh won the Nobel Peace Prize for its innovative microfinancing operations. In March 2011, Grameen Bank founder Muhammad Yunus was ousted as head of the microfinance lender by the Bangladesh government, which owns 25% of the company. The government claims Yunus, 70, is far past its country's mandatory retirement age (60). 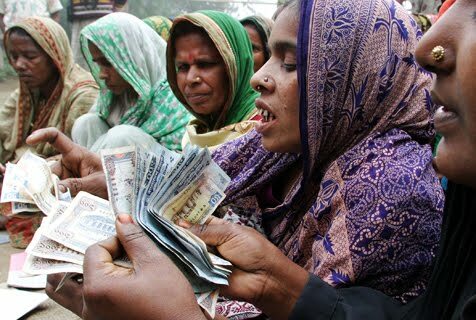 While Yunus's ousting has captured worldwide attention and the government's motives remain under scrutiny, author Lamia Karim (Microfinance and Its Discontents) asks what will happen to the women who obtain these microcredit loans. A Grameen borrower, identified as Grameen Phone Lady, with her Telenor cell phone in 2007. The rise and fall of Muhammad Yunus is a tragedy of Shakespearean proportions. In the Bengali culture of irsha (envy), it was only a matter of time before the ire of the Prime Minister would fall on the Nobel laureate. After all, Yunus, the darling of the international development set of heads of states, CEOs, and philanthropists, went to places that no Bangladeshi had gone before—Oslo for a Nobel; Davos; meetings with heads of states; not to mention his personal friendship with the Clintons! Yunus is most famous person in Bangladesh and has brought fame and recognition to the country. He is also a global leader of the microfinance movement, and his removal may send shudders through the industry—especially in Bangladesh. In the last few months, there has been a flurry of news reports on the negative consequences of microfinance in South Asia. Grameen Bank, the paradigmatic institution of microfinance, and its charismatic founder, Yunus, have been in the midst of this furor. The bank and its founder are winners of the 2006 Nobel Peace Prize. On March 2, 2011, the Bangladesh Bank sacked Nobel laureate Professor Muhammad Yunus as managing director of the Grameen Bank. The bank is 25% owned by the government of Bangladesh. Yet it has always operated as an independent entity. According to a parliamentary watchdog committee, the bank does not follow the 2006 Microcredit Regulatory Act. That is, there are countless differences in how the Grameen Bank is operationally distinct from government banks. The unraveling of Yunus, also known as the godfather of microcredit/microfinance, began with the airing of Caught in Debt, a Norwegian documentary, in 2010. The documentary showed that in 1996 Yunus transferred $100 million meant for Grameen borrowers to one of the Bank’s subsidiary companies, Grameen Kalyan, without knowledge of the Norwegian donors. While the Norwegians now claim that there was no wrongdoing on Yunus’s part, the Bangladesh government began an investigation. At present, there are three cases pending against Yunus and Grameen Bank for fiscal and other irregularities that are considered by many as largely frivolous. The online news agency bdnews24.com reported that Yunus had given the printing contract of the Grameen Bank to his family business. In a kin-based society, it is not surprising that Yunus favored his family over an outsider. While Yunus supporters note that no dividends or profit came to the family, one has to raise some difficult questions about judgment. Surely, this large contract helped the family business financially. It is equally important to remember that the Grameen Bank did not historically place field officers in their native villages as a means of preventing nepotism. While Yunus and the Grameen Bank’s advocates claim that the bank is owned by the poor women as shareholders, one has to ask whether these women shareholders were consulted about this huge award to Yunus’s family, and whether it was in the best interest of the shareholders. These questions are curiously missing from his supporters. Like its founder, the “miracle” stories of microfinance empowering poor women in Bangladesh have also come under scrutiny in recent news reports. In my research, I have documented how the failure to pay back microfinance loans has resulted in heightened shame and pressure on poor women in Bangladesh. I found that in 90% of cases, the users of these loans were their husbands. But the women remained responsible for the loan repayments. Default by a lone woman resulted in friction among group members who were collectively held responsible for individual loans. Women who could not pay due to unforeseen circumstances (illness, poor investment decisions, theft of property) were subjected to public shaming by microfinance institutions. In a face-to-face society like Bangladesh, the conduct of women is strictly controlled, and women are the custodians of family honor. Shaming women publicly brings dishonor on men and the entire family. Hence, poor women bear the social costs of microfinance, often with negative consequences. Moreover, the interest rates on the loans are astronomically high (the Bangladeshi government capped it at 27% in 2010), and loans often come with product tie-ins, such as hybrid seeds and breeder chickens. These are troubling aspects of a model touted as one that empowers poor women. When poor women are unable to repay loans due to unforeseen catastrophe (death or illness in the family, loss of business due to theft, etc. ), does the Grameen Bank forgive their debt? Has it ever? Who advocates for these hapless women? In my book, I have recounted stories from some of the earliest members of the Grameen Bank, who suffered greatly because their businesses could not take off as planned. Yet, no one came to advocate for them in international newspapers. Turning to the question of Yunus’s sacking by the Central Bank: Yunus has never been a supporter of Sheikh Hasina, the current Prime Minister of Bangladesh. In 1996, Yunus was a member of the caretaker government as the country prepared for national elections. So he is not completely new to politics. The attorney general of the country in a recent televised press briefing said that if anyone should win the Nobel Peace Prize in Bangladesh, it should have been the Prime Minister Sheikh Hasina for signing a peace accord with the Chakmas in the Chittagong Hill Tracts, who fought an insurgency since the 1970s. In fact, Hasina’s supporters tried to nominate her for the Nobel Peace Prize in the late 1990s. Matters only get more complicated. In 2007, Yunus attempted to form a political party—a decision he later recanted. The majority of his supporters were diasporic Bangladeshis who saw the Nobel laureate as endowing their country with global stature. Yunus’s play for power caused ire from Hasina who saw him as a possible political adversary, and one who had won international renown that she had not received. Thus, when the Norwegian documentary aired, it gave the Prime Minister the ammunition to humble Yunus by removing him from power. Yet at 70, Yunus is ten years beyond the mandatory retirement age of 60 in Bangladesh. Surely we must ask: why did it take the government ten years to wake up to that fact? And why did Yunus himself not realize it, and step down gracefully? The question remains, why now? In 2012, Bangladeshis will again vote in national politics. What better time to send a warning signal to any uppity NGO leader of the dire consequences of acting against the interests of the ruling party? With more than 9 million borrowers, the resource-rich Grameen Bank is a formidable vote bank. If its charismatic leader goes into politics, he can take away votes from Hasina’s ruling party, although he cannot undermine the party. Moreover, government bureaucrats, such as the director of the Bangladesh Bank, find Yunus as a law unto himself because of his international stature. Bureaucrats feel that Grameen Bank (and other NGOs) receive donor funds that should go to the government. Finally, there are ongoing turf battles among the largest microfinance NGOs in the country. The removal of Yunus and the weakening of Grameen Bank would give these competitor NGOs an advantage to recruit “credit-worthy” members, and to create more power and resources for themselves. It is this toxic brew of power and envy that has embroiled Nobel laureate Yunus in a legal dispute with the current government. In the western fetishization of this iconic individual, the real issue is that the ever-deepening debt crisis for poor women is forgotten. And that is the saddest part of the story. 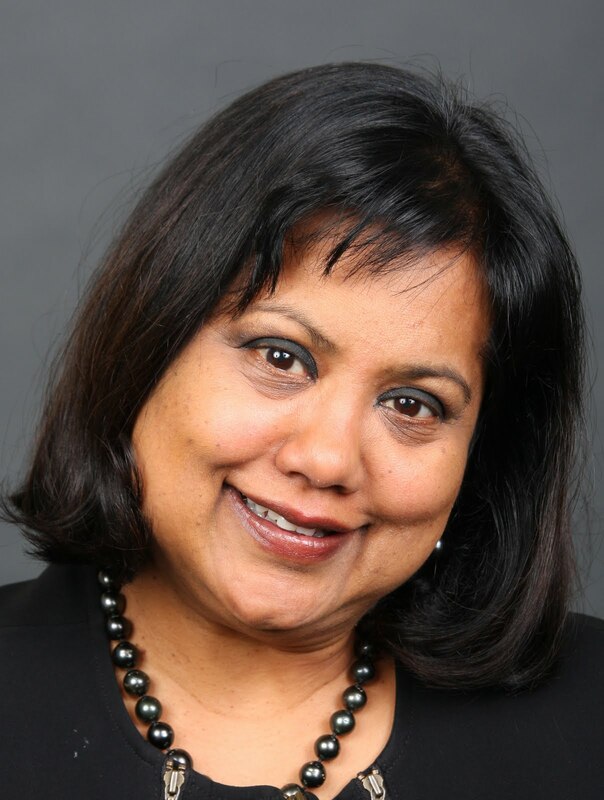 Lamia Karim is author of Microfinance and Its Discontents: Women in Debt in Bangladesh. Read an excerpt from the book, published to our blog earlier this month. You can also check out a recently published video interview with University of Oregon Today. The thriving, supportive, underrepresented LGBT scene in 1960s-70s Minneapolis. 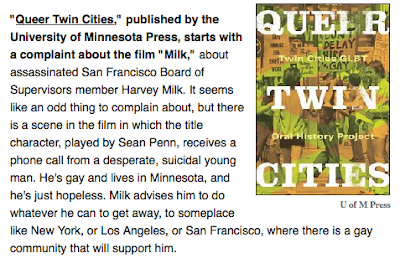 MinnPost recently published a wonderful analysis of Queer Twin Cities, particularly an issue it takes with a scene in the much-acclaimed 2008 film Milk. When a straight Hebrew school student in Minneapolis can accidentally become a patron of a gay bookstore in the 1970s, there's really no need for anybody to move to San Francisco. In his book Out of Time: Desire in Atemporal Cinema, author Todd McGowan takes as his starting point the emergence of a temporal aesthetic in cinema that arose in response to the digital era. Linking developments in cinema to current debates within philosophy, McGowan claims that films that change the viewer's relation to time constitute a new cinematic mode: atemporal cinema. In this post, McGowan discusses popular film director Christopher Nolan's unique examples of atemporal cinema. McGowan is associate professor of film studies at the University of Vermont. He is also author of The Impossible David Lynch and The Real Gaze: Film Theory after Lacan. Many of Christopher Nolan’s films qualify as examples of what I call atemporal cinema. I explain this concept at length in Out of Time, but in short, it covers films that break from linear chronology in order to emphasize the repetition of the psychoanalytic drive. In the drive, the future does not provide the promise of desire’s realization but rather a repeated failure to attain its object. By scrambling chronology, atemporal films make evident this failure for the spectator and thus encourage the spectator to embrace the repetition of the drive rather than put their faith in a different future. Though Nolan’s Inception appeared too recently to make it into the book, this film fits well within the atemporal mode. At first glance, Inception seems like a chronological account of Cobb (Leonardo DiCaprio) as he attempts to perform an act of inception (planting an idea inside the mind of someone) in order ultimately to be reunited with his children. But because the film plunges us constantly into the world of dreams, the past, present, and future meld together, and it is not clear that the ending represents a forward movement in time relative to the beginning. Nolan plays with linear chronology in earlier films like Following, Memento, and The Prestige, but in Inception this play is specifically tied to the logic of the dream. Unquestionably the key subject of debate that the film has raised concerns its conclusion. The final shot of the film focuses on a top spinning on a table, and this top, as Cobb explains earlier in the film, functions as a totem, a device used to determine if one is in the real world or in someone else’s dream. The fact that the top continues to spin as the film cuts to black leaves ambiguous the reality of Cobb’s reconciliation with his children that concludes the film after the successful act of inception. Critics have argued that the reconciliation occurs in the dream world rather than in reality, or, more radically, that the entire film takes place in Cobb’s dream. The reality of the final scene has occasioned a firestorm of critical and online debate. If we understand Nolan’s film in the terms of atemporal cinema, the question of the conclusion’s reality ceases to be the fundamental question of the film. In atemporal cinema, one never attains one’s privileged object—like Cobb’s reconciliation with his children—but instead continues to miss this object in various ways. I would like to suggest that the deception that Nolan performs in this film lies in encouraging us to dwell on the question of what is real and what isn’t instead of the question of Cobb’s relation to his own desire. This is where we can locate the significance of the film. Like the protagonist of Memento, Cobb at first appears like a reliable source of identification only to prove himself completely misleading for the spectator. He presents his wife, Mal (Marion Cotillard), as an obstacle to his attempts at dream theft or at inception, and yet this obstacle represents his privileged object, even as she is lost to him. When she thwarts his plans, she is playing the part of this object, though Cobb believes that she is an obstacle that he must overcome. The film subtly asks the spectator to take the side the obstacle rather than the protagonist, as it reveals Cobb’s tendency to self-deception and his investment in an illusory reconciliation. The question that becomes foremost is not whether or not we are in reality but what relation we take up to our object. 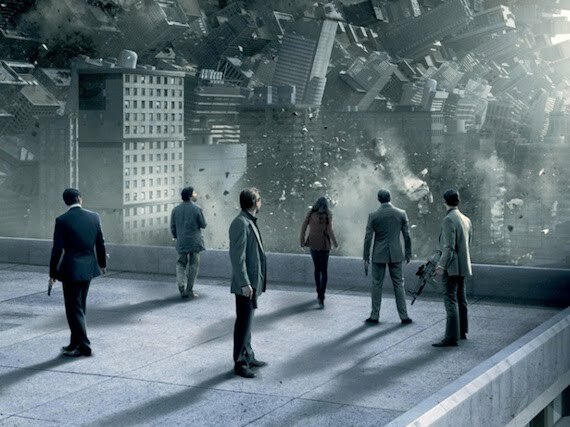 Understanding Inception as an atemporal film helps us to see the precise nature of the question that it poses. For further reading, check out McGowan's Out of Time: Desire in Atemporal Cinema, which also evaluates Pulp Fiction, The Butterfly Effect, Eternal Sunshine of the Spotless Mind, and 21 Grams, among many other films. 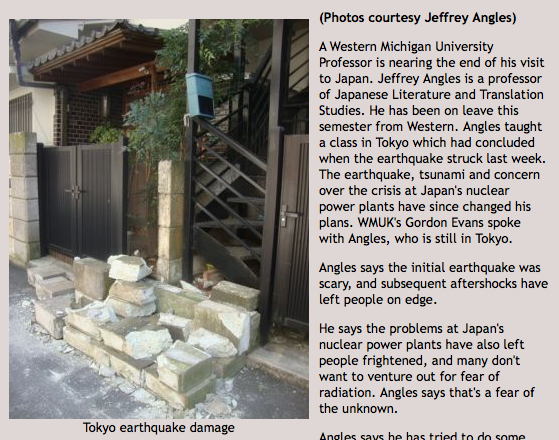 Author Jeffrey Angles (Writing the Love of Boys) was in Tokyo when Japan's 9.0-magnitude earthquake struck on March 11th. He talks about his experience on a local NPR station. 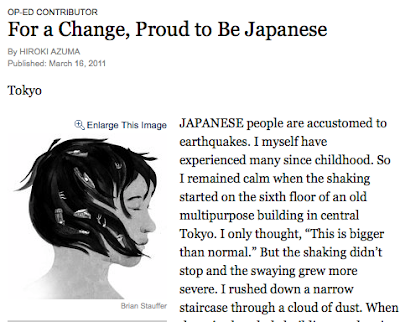 Author Hiroki Azuma in NYT: "I wish to see a ray of hope in this phenomenon." On NYT's Opinion Pages: "Though concrete predictions and assessments will have to wait, there is one thing that can be said on the sixth day since the quake: the Japanese people have begun to see their nation in a more positive light than they have in at least 20 or 30 years." 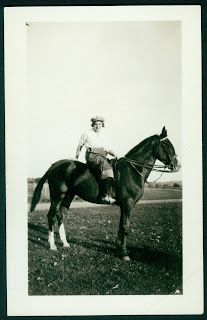 Clotilde "Coco" Irvine Moles (1914-1975), daughter of a lumber baron, grew up with sister Olivia Irvine Dodge in a mansion on fashionable Summit Avenue at a time when music, art, and women's social status were all in a state of flux and the economy was still flying high. Here, popular Minnesota author Peg Meier recounts how she found Coco's diary in the Minnesota Historical Society archives and why she decided to get it published. Former Star Tribune reporter and popular author. Meier wrote the introduction and afterword to Through No Fault of My Own. A treasure hunt, that’s what it is. For fun, I sift through archives of the Minnesota Historical Society. Some days, nothing golden shows up. Other days, bonanza! 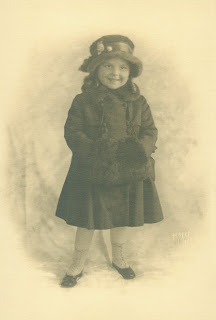 Clotilde "Coco" Irvine at age five. Avenue at the peak of the Jazz Age. One of my best finds was the 1927 diary of a St. Paul girl. Her name was Coco Irvine, and she turned 13 that January. Her one-year diary made it clear she was smart, funny, adventurous and prone to getting into trouble. Lots of trouble. -Helping herself to her older sister’s car and crashing into her mother’s. -Repeatedly bouncing a basketball against a school wall and “accidentally” setting off the fire alarm. -Telling a dirty joke at the family dinner table. Yet Coco rarely accepted responsibility for her actions. Hence, the title of the resulting book, Through No Fault of My Own, her frequent disclaimer. I was giggling as I read the diary, but I was in the Historical Society’s somber library so I tried to contain myself. This has got to be published, I thought. At the time of “discovery,” I was working on a book about childhood in Minnesota, from the 1830s on. I was searching for stories written by kids and for reminiscences of childhood, plus fun old photographs. Coco was perfect for it. Pieces of Coco’s diary made it into my book Wishing for a Snow Day: Growing Up in Minnesota (Minnesota Historical Society Press, 2010). But I could just envision Coco’s diary as a little book, with every word of the diary and pictures of this charming kid. Who was she? She seemed to be from a rich family; was she? What happened to her in adulthood? Well ... it turns out you may have been in the house where Coco was raised. It’s on glorious Summit Avenue in St. Paul — and it is now the Minnesota Governor’s Residence. Their father was a wealthy lumber baron, and the 20-room mansion features remarkable woods from around the world. In 1965, Coco and her younger sister, Olivia Irvine Dodge, donated the family home to the state. Yikes. This story was getting better and better. I needed more. Coco died in 1975 at the age of 61, I learned. Her sister was living. Olivia Dodge welcomed me to her West St. Paul mansion. She told me all about Coco. Later I got to meet Coco’s only child, her gracious daughter, Vicki Ford. The University of Minnesota Press — specifically senior acquisitions editor Todd Orjala — swept it up. He had me write the foreword and afterword, collect photos and put the whole thing into context. Meanwhile, the History Theatre — specifically Ron Peluso, artistic director — in downtown St. Paul also loved Coco. He and playwright Bob Beverage wrote a play, “Coco’s Diary,” based closely on the diary. It opens March 3rd, 2012. It’s utterly charming. I can testify to that because the theater had two readings, one in the theater and one on the backyard patio of the Governor’s Residence. The audiences were wild about Coco. So the 1927 story of this 13-year-old girl will be heard, for years to come. She should inspire kids to creatively misbehave — and write about it! Read more about Through No Fault of My Own. See what Publishers Weekly and Kirkus Reviews think about Coco's diary. Peg Meier will be reading at the launch event for this book at 2PM on Saturday, April 16th, at Virginia Street Swedenborgian Church in St. Paul (sponsored by Common Good Books). She will also be reading at 7:30PM on Monday, April 18th, at Magers & Quinn in Minneapolis. "An unrepentant attention-seeker, Coco gets into frequent trouble at home and at school, but her exuberance, defiance, and sweetness will win over readers from her first entry. Photos of Coco and an afterword about her (fairly tragic) adult life round out an otherwise blithe glimpse into the past." Bangladeshi women count money for repayment to a microcredit bank. Author Lamia Karim's new book asks why we know so little about microfinance's consequences. Image source. In 2006 the Grameen Bank of Bangladesh won the Nobel Peace Prize for its innovative microfinancing operations. Lamia Karim, associate professor of cultural anthropology at the University of Oregon, Eugene, takes a critical look at the Grameen Bank and three of the leading NGOs in Bangladesh in Microfinance and Its Discontents: Women in Debt in Bangladesh (available this month from UMP). Amid euphoria over the benefits of microfinance, Karim offers a timely and sobering perspective on the practical, and possibly detrimental, realities for poor women inducted into microfinance operations. Most recently, Karim has been interviewed on NPR and quoted in Wall Street Journal on account of recent developments with Grameen Bank's founder, Muhammad Yunis, and the government of Bangladesh's efforts to oust him under a law proclaiming mandatory retirement at age of 60 (Yunis is 70). The question is—why now? These still-unfolding events have shone some public light into the practice of microfinancing. As NPR notes, out of around 7.5 million borrowers, 97% are women. The microcredit loans are touted as loans that are almost always repaid on time and in full. However, as Karim points out, the realities of the women who acquire these loans are such that they are flung deeper and deeper into debt, and that more oversight is needed. The following is a passage from the Preface of Karim's book. What brought me to the study of microfinance and gender was a puzzle about rural women's entrepreneurship and economic empowerment. Bangladesh is one of the most economically depressed countries in the world, and yet the Grameen Bank and the other three NGOs I studied all boasted a 98 percent rate of loan recovery. Either rural Bangladeshi women were all becoming successful mini-entrepreneurs through these microfinance NGOs, or there was a hidden story behind these high recovery rates. I was provoked by the following questions: What gave one of the poorest countries in the world some of the most creditworthy clients? What does it take to empower women? Is money enough? Rejecting the moralistic discourse that the poor pay back because of a natural correlation between honesty and poverty, I felt instead that there was a complex picture behind these high repayment numbers. I chose Bangladesh for my research because I wanted to discover the story behind the rhetoric of these NGOs. The initial research was conducted between 1998 and 1999, with follow-up research in 2007. During these years, I have kept pace with the trends within the Bangladeshi microfinance industry. More importantly, I am from Bangladesh, I speak the language fluently, and I have social networks that connect me to the local research and activist communities. In my visits to Bangladesh, I noticed that microfinance had become one of the most regularized aspects of development programs. In order to update my earlier findings, in 2007 I conducted a small study of female borrowers of the Grameen Bank who are known as Grameen phone ladies. These women had purchased Telenor cellular phones with their microfinance loans, and were operating as village phone ladies. While on the ground, microfinance policies were being expanded to new areas, I found that the basic formulation of loans equal economic empowerment remained unchanged. Given that so much euphoria has resulted over microfinance, why is it that we know so little about its consequences from alternative perspectives? Although recent research by independent scholars in Bangladesh documents that microfinance policies undertaken by Grameen Bank and the leading microfinance NGOs do not benefit the poor, such research remains relatively unknown outside of Bangladesh. In fact, a robust critical discourse regarding microfinance is available in the vernacular literature in Bangladesh that is not accessible to Western readers. Hence, studies such as mine have an important role to play in exposing the consequences of microfinance in the lives of poower women. ... This book is an invitation to open up the debate on this practice, to entertain alternatives to the dominant discourses of knowledge, to push the boundaries, and to analyze the ways in which ordinary people make meaning of these policies and practices in their daily struggles with globalization. Find out more in Microfinance and Its Discontents. The beginning of the end of American dominance in the Middle East? 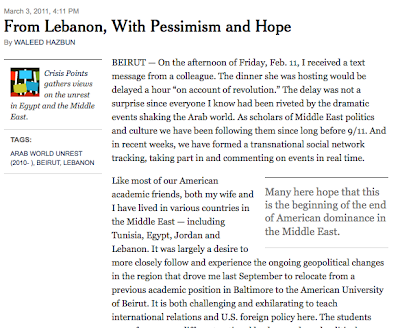 Author Waleed Hazbun surveys the aftermath of Egypt's historic protests on NYT's Opinion pages. Read Hazbun's January article about geopolitical transformation in the Middle East. From seventeenth-century broadsides about the handling of dead bodies, printed during London’s plague years, to YouTube videos about preventing the transmission of STDs, public health advocacy and education has always had a powerful visual component. Imagining Illness explores, through various essays, the diverse visual culture of public health, broadly defined, from the nineteenth century to the present. We spoke briefly with Imagining Illness editor David Serlin, associate professor of communication and science studies at the University of California, San Diego, about the future of the public service announcement. You'll find a link to downloading the book's captivating introduction at the bottom of this post. You chose to lead the book's introduction with discussion of the public health video "HPV Boredom 2." How does this video illustrate the variety of information that Imagining Illness's essays cover? I think HPV Boredom 2 captures the gestalt of the moment. Not so much because of the public health threat that HPV itself poses — though it is certainly a serious issue to be reckoned with — but because the way that its emergence in the early twenty-first century provides a palpable example of how the meaning and significance we attach to a contemporary epidemiological crisis is transformed when it collides with a contemporary visual medium. The fact that discussions in both popular and professional arenas about the diagnosis and treatment of HPV are being shaped by individuals making videos on their laptops while sitting in distinguished book-lined offices or at desks in their family living rooms or dorm rooms is not, to my mind, an insignificant component of contemporary health discourse. But while the “do-it-yourself” aspect of YouTube may seem like an unprecedented phase of public health discourse, I also believe strongly that the visual dimension of public health — how information is conveyed and disseminated to us, how rhetorical tactics are used to inspire or frighten us — is not unique to the contemporary moment. In fact, the participatory dimension of media like YouTube is only the most recent wrinkle in a series of long and complex visual histories that make up the larger history of public health. One of the recurring themes found throughout the thirteen essays in Imagining Illness is that there is a dynamic tension, and often an enormous gulf, between the work that public health media are designed to do and what they actually accomplish, if anything at all. By using the video HPV Boredom 2, I was able to address both the visual culture of public health taking shape in the current moment and also show how such videos represent a point on a continuum that has been expanding since at least the seventeenth century. David Serlin is editor of Imagining Illness: Public Health and Visual Culture. Download his introduction to Imagining Illness.